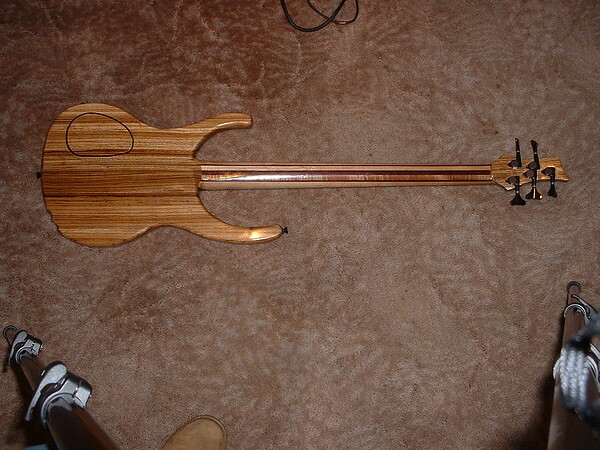 I was looking through some old photos when I came across some pictures of the 5 string Bass guitar I built a few years ago and I thought I'd share them with the group. I have a couple of in-construction pictures, 1st up is a shot of the neck. I should explain that this is a "Thru-neck" design, that is, instead of the neck bolting on to the body like a lot of guitars, the neck extends all the way thru the body. I decided to make it up like a sophisticated sarnie consisting of ( takes deep breath ) Purpleheart-Maple-Purpleheart(thin strip)-Maple-Purpleheart-Maple-Purpleheart(thin strip)-Maple-Purpleheart (Phew!!) a total of 9 laminations. Gluing all of this up was quite a challenge as the glue had a working time of only 30 mins and had to be applied evenly, and thinly, to each mating side, then align and then clamp up while keeping alignment. 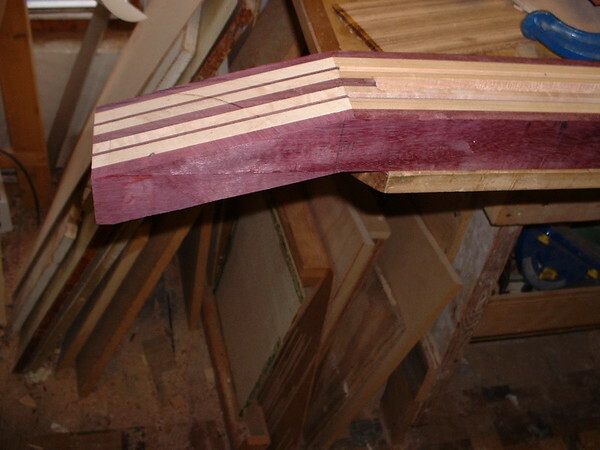 You might note that it seems from that photo that there is a section of the centre "Purpleheart" lamination that is missing. 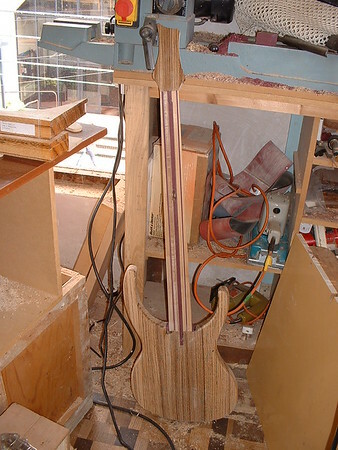 It is there, but it has been routed out to make space for a "Truss-rod", a device for counteracting the tension of the strings and stopping the neck bending into a banana. This is a closer view of the body-section of the neck. To make for more comfortable playing, the neck can be angled backwards slightly, but with a Thru-Neck design it is easier to angle the body, hence the angled cut. This is a closer view of the headstock end, it's made by a long scarf joint, but made by attaching the scarfed bit on the wrong side. Fortunately all the laminations lined up ok. This is what the body was made out of, they started out as 2 7"x24" pieces of 2" thick Zebrano, or Zebrawood. 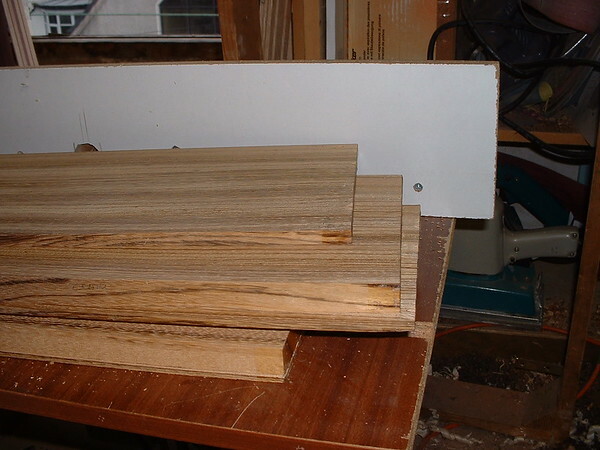 Each piece was then cut ( very carefully ) into 3 slices of 1/4", 1" and 3/8" thick 7"x24" slices. This close-up shows how I tried to get the grain matched up between the 3 "slices" of each body piece talked about earlier. Really nice job Tim. I am assuming you play. Got any youtube videos? i made a double neck bass (four and eight string) and a double neck guitar (six and twelve string) when i was in high school. they both were neck through body. allot of work but when you have very limited funds and your dad is a cabinet maker you just do what you can with what you have. i even made the bridges for both guitars. Very nice wood working there Tim. I'm ashamed to say I havent even lifted it in ages I was in a little band that played mainly covers of mainstream type stuff, but the band went our seperate ways years ago. I know nowt about guitars....... But, that is beautiful! Tim, sorry I missed this yesterday. This build is fantastic, can you not find any more pictures of the build between the jump from gluing to complete guitar? How long did it take you and did you run from plans? How do you embed the frets? I`ve played guitar for 18 years and would absolutely love one day to build a 6 string guitar from scratch. A Fender Squire Strat from over 20 years ago, when Fender allowed them to be made under licence(not like the crap that is mass produced now with some fancy name to make them sell) with Fender branded parts..
can you not find any more pictures of the build between the jump from gluing to complete guitar? I think it took me about 4months from concept to completely finished, but I was only working on it a couple of evenings a week. I made the plans myself, I drew out the shape on the computer to start with, just to get the shape looking as I wanted, then drew it out full scale on the back of some ( unused ) wallpaper. The designing of it was fairly simple, once you decide on what scale length you want, then what electronics you want to use, what bridge or whether you want to make your own bridge. Once you decide on all that, you can make it pretty much whatever shape you want, so long as it can hold all the "bits" that you want to put in it, and that it is playable. The frets are easy, there is even a freeware program that will print out a 1:1 scale drawing of the fretboard that you then stick to the fretboard and cut the fret slots. These are cut with a precise thickness saw, and then the frets themselves are pressed into said slots. The frets have a tang that has tiny barbs in it that grip in the fretboard slots. 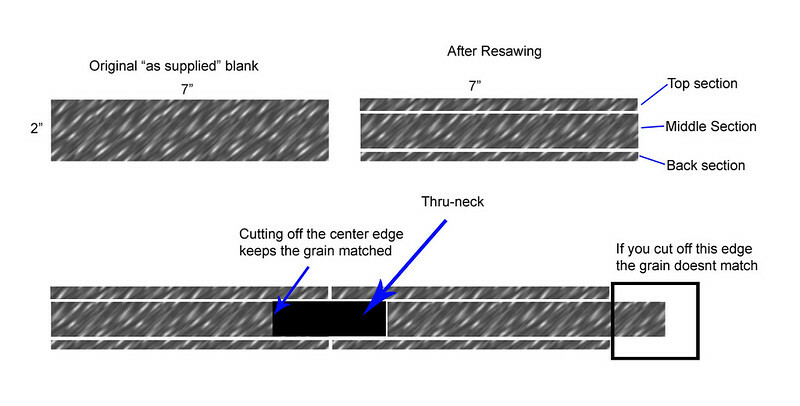 If the slots are too narrow the frets will actually bend the fretboard and even the neck. If the slots are too wide then the frets will not stay seated, but some people do cut them oversized and then glue the frets in. That sounds like a nice collection you've got there John, my beloved bought me a Tak' electro-acoustic a bit earlier this year, so I've been playing a bit with that. Thanks for the link Tim - it is on my to-do list! Need to get this clock build first. John - A Bandit 112 is what I also use - quality amp and you can pick them up cheap second hand now. I had one years and years ago then sold it. Managed to buy one for £35 on flebay about 3 years ago. I like metal and heavy rock in terms of playing (not so much listening to these days) and I think it has a pretty decent sound with both the thrash and gain buttons depressed. Also nice reverb and crisp on clean! Good Amp for the cash! Well I managed to find a couple more pics of the build, sadly only a few from just one stage of the build, I guess I wasnt as hot on taking in-progress pics back then. Anyway, here they are, this is probably about half-way thru the build. These are taken after attaching the body to the neck but before cutting the fretboard slots or attaching the fretboard to the neck or routing the recesses for the pickups. I looked thru every one of my old photos but could not find any others of the build , but feel free to ask anything about the build process and I'll try to answer. At least now you know that you need to take pics of your projects as you go or we won't leave you alone. BTW, how does a guitar like this pick up sound since it isn't hollow? I'm a complete dummy when it comes to musical instruments. how does a guitar like this pick up sound since it isn't hollow? I'm a complete dummy when it comes to musical instruments. So your talking about something similar to a microphone picking up the vibrations of the strings and then going through an amplifier to make the sounds louder? BTW, how does a guitar like this pick up sound since it isn't hollow? With most electric guitars they pick up the sound via the "Pickups". The principle is that the strings are steel, when strummed or plucked, the string will vibrate, the "Pickups" are basically a large coil of wire with "poles" of iron under each string ( or sometimes a long single pole that runs the width under all the strings ) set into the centre of the coil. The vibrating steel string will therefore induce a oscillating magnetic field that gets picked up via the "pickup" and that outputs a ( quite weak, but stronger than a microphone's output ) electrical signal that represents the oscillations of the strings. More recently another method has become popular, and that is to use a piezo strip sandwiched between the bridge ( the anchor of the strings on the body ) and the body itself. The piezo picks up the vibrations of the strings that way. This is used a lot with electro-acoustic guitars. With most electric guitars they pick up the sound via the "Pickups". The principle is that the strings are steel, when strummed or plucked, the string will vibrate, the "Pickups" are basically a large coil of wire with "poles" of iron under each string set into the centre of the coil. The vibrating steel string will therefore induce a oscillating magnetic field that gets picked up via the "pickup" and that outputs an electrical signal that represents the oscillations of the strings. Tim, you have built quite a nice bass . Thanks for the extra pictures! Tim. in your last photos, is there a slot in the back of the neck and is this for the trus rod? How is this fixed in the next and can you adjust the tension on it? Chris, Yes that is a truss rod slot cut into the front of the neck,( some manufacturers do install them from the back of the neck, Fender is one example that springs to mind, they then cover the slot with a filler strip, often in a contrasting wood to the neck, ie a walnut strip in a maple neck, but I didnt want the hassle of making a filler strip that was exactly the right size for the slot so I made my slot in the front, under where the fingerboard will sit. ) it seats just underneath the fingerboard. You can make your own truss rod if that tickles your fancy, they are just a ali U channel with a steel rod thru the centre of the U, the rod has a flat washer fixed on one end to stop it from being pulled thru the U, and the other end is threaded with another washer and a nut ( usually a hex socket type nut ). 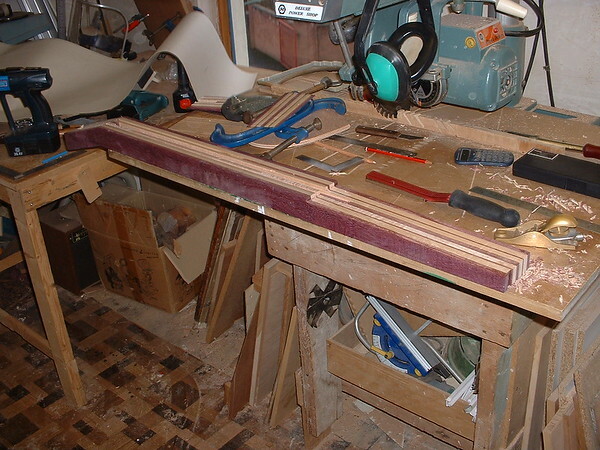 The truss rod is positioned so that the open side of the "U" is facing the back of the fingerboard. Then when the truss rod nut is tightened it will try to bend the neck backwards, and will actually do so if you tighten it too much. 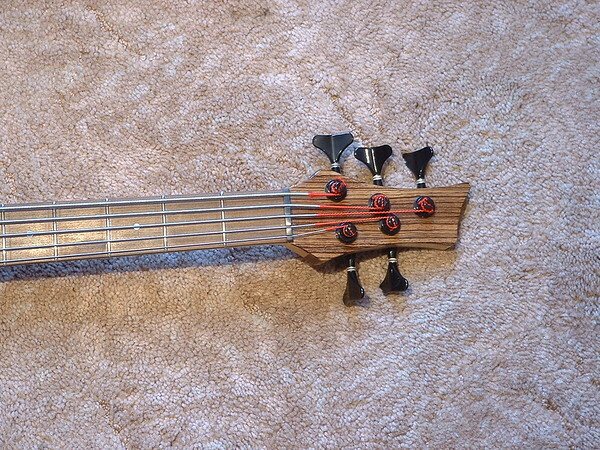 The goal is to just counteract the tension that the strings are causing on the neck. 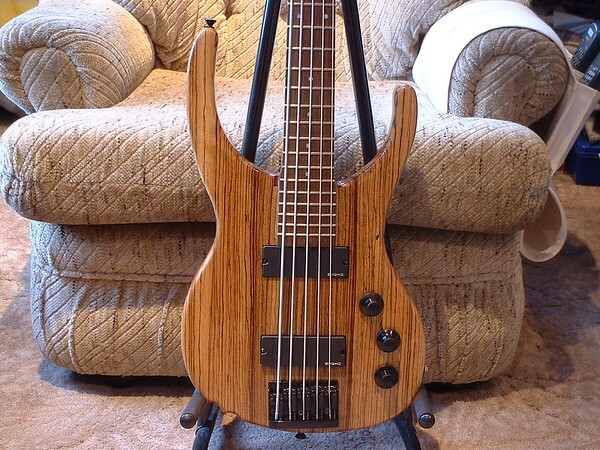 Without any form of truss-rod or neck stiffening, over a relatively short time the neck would bend forward. Some builders put carbon-fibre rods in the neck to add extra stiffening, and some use what is called a double acting truss rod, but I cant remember exactly how they differ from the truss rod I described above. I`m with you. Thanks for the info. The wood is lovely, can I ask how much it would cost for the necessary timber alone at the present time, very roughly? I know it was a while back since you bought this. I believe the gluing of the through neck is quite ticky? - did you find it so? 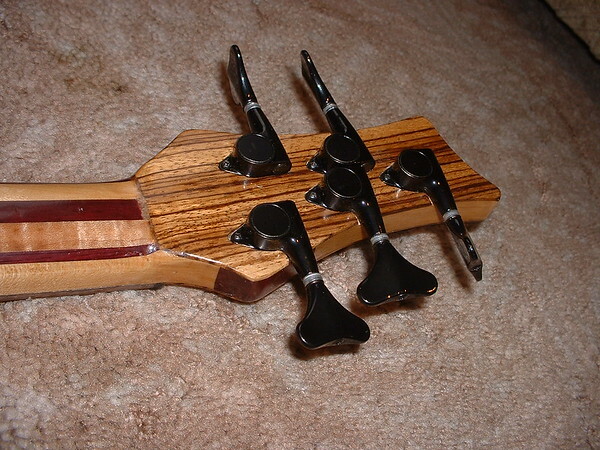 EDIT Tim - just re-read your first post and you mention gluing the neck...ignore that then. How are the body laminates glued to the body side of the neck? The wood is lovely, can I ask how much it would cost for the necessary timber alone at the present time, very roughly? Well, if I remember rightly, it cost about £35 for the Zebrano body blanks, and around a total of £30 for all the neck pieces. I got them from Craft supplies Click me, I've just done a check and the prices have gone up a bit since then ( I think I bought the wood in 2002, but didnt build it til 2003 ) It pays to go up there if you can, they used to have more stuff in stock than was on the website, and you can get to look at exactly what you are buying. The price will totally depend on what sort of wood you want, and that depends on whether you want to have a clear / stained finish with the grain of the wood showing thru, or if you want a solid colour ( ie paint ). There are some lovely guitars that are either finished with a clear coat, or stained, made out of the top grade "Flamed Maple" ( grade AAAA ). They have an almost 3d look of them, but the wood is so expensive that most would just have a 3/8" to 1" thick veneer of the AAAA grade on the top of some cheaper maple or mahogany. But if you are going to paint a solid colour as your finish there is no point spending big buck on fancy looking wood, just use some good quality plain maple, ash or mahogany. The more expensive wood doesnt add to the quality of the sound IMHO, but it sure looks pretty when finished well. 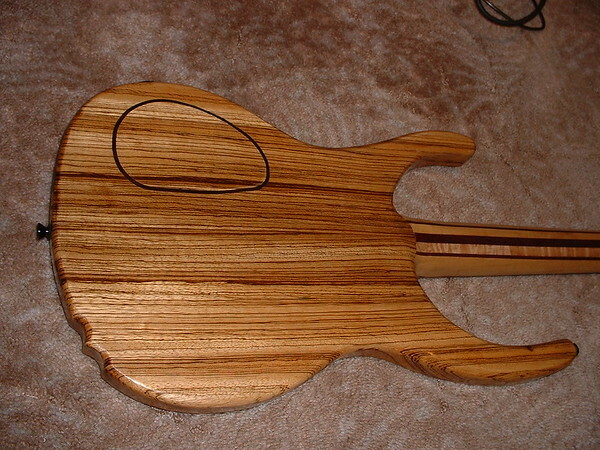 If I was to make another it would most likely be a Les Paul copy with a "AAAA" flamed maple top. 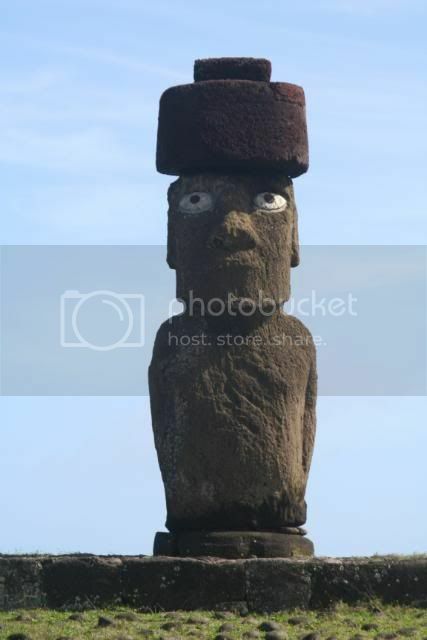 EDIT Tim - just re-read your first post and you mention gluing the neck...ignore that then. How are the body laminates glued to the body side of the neck? As I briefly mentioned in the 1st post, the timber as supplied from craft supplies comes as 2 planks approx 7" x 24" x 2" thick ( they do sell 1 piece body blanks now ) I carefully marked up which surfaces looked best together as the front, and also marked up the opposite faces as the back. The reason for marking both faces will become clear. 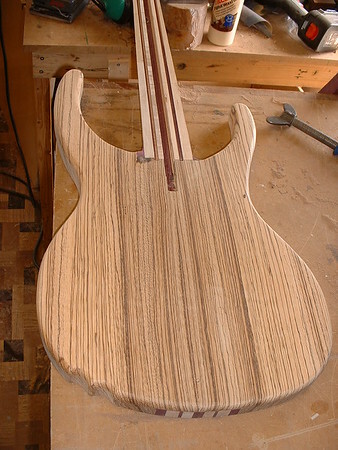 I had in mind that I wanted the front to look like it was just made out of the Zebrano, ie I wanted to cover over the "Thru-neck" laminations of maple and purpleheart. So this would require that I cut off, or Resaw, the body blanks to get 2 pieces of Zebrano approx 10mm thick. 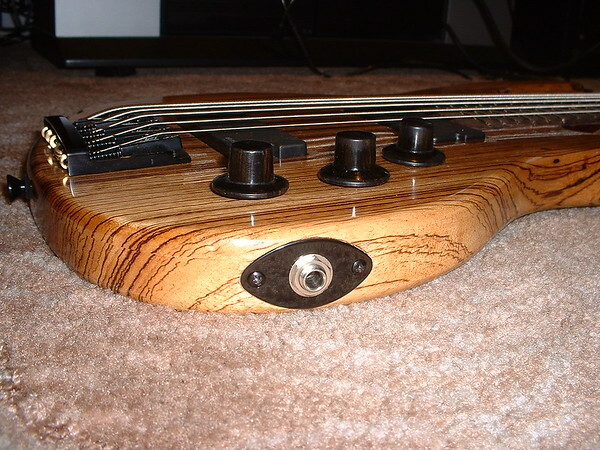 I also had in mind that I wanted the back of the body to be similarly solid looking and covering up the "thru-neck" laminations, and to complicate things further I also wanted to have the electronics cover match the grain of the rest of the back. So this would require that I resaw the rear of the body blanks to get a approx 8mm slice. With all these resawing operations to do, the likelihood of getting the pieces mixed up was rather large, so I employed a cunning trick to be able to identify which piece was which and also which way up ( or down, or around ) each piece should be. 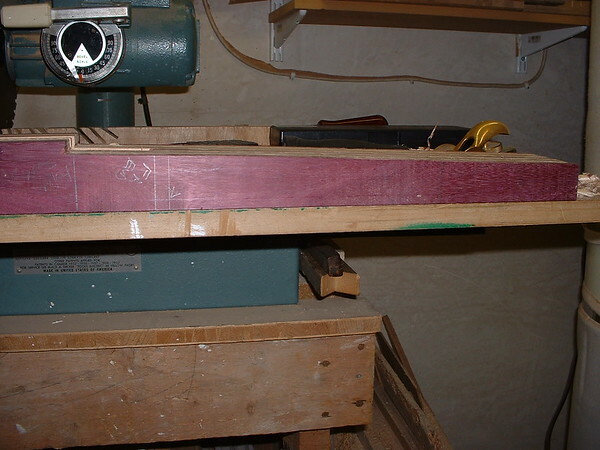 On one of the 2 original body blanks, before making any cuts or slices, I made a shallow saw cut down one outside edge ( across the 2" thickness ) to a depth of about 3-5mm, this was at a point that would be eventually cut off when shaping the body. On the other body blank I drilled a hole (about 3-4mm hole) thru the 2" thickness, again on the outer edge in a place that would be cut away later. By doing this, once all the slices had been made, these holes or shallow cuts would only line up correctly if the all the pieces were assembled in the right order and the right way up. Anyway, back to your question Chris. 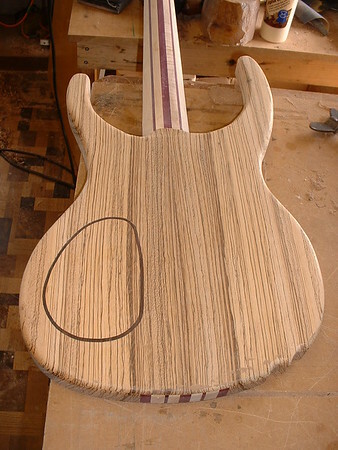 Once I had sliced up the body blanks and cleaned them up by running them thru the surface planer, I was left with 2 top pieces, 2 middle pieces and 2 back pieces, and of course the neck that I had already laminated up. On this pic you can see some feint pencil lines indicating the thickness that the "middle" pieces of the body were, and so the amount that would have to be removed from the this part of the neck. Once this section of the neck was reduced to the same thickness of the middle sections of the body, I then carefull measured the width of the neck and removed half the neck-width's amount from the center of each middle body section so that when assembled, the grain from both top pieces would match as closely as possible thru the middle and back sections. Then it was just a case of gluing the middle sections to either side of the neck, carefully clamping it up while checking that nothing moves, then just wait 24hrs before removing clamps. Then it became much easier for attaching the 2 top pieces, after making sure that the previous assembly was plained and sanded perfectly flat, glue was applied and then the top pieces were clamped on using as many clamps as I could lay my hands on. The same process was used for the back, except on the back I had to rout out a recess for the electronics and I had to make the cutout for the electronics cover before gluing the back pieces on. I forgot to say that I got most of my hardware ( tuners, bridges, pickups and guitar-specific tools from Stewmac in the US. The delivery was incredibly fast, I ordered on monday evening and it arrived on thursday morning @10am. I've just had a look at Stemac's site, whoa prices seem to have graduated northwards since I last bought off them. Thanks for the indepth description of how an electric guitar works. Makes a lot more sense now. Discovered him, as one of my favorite bassists (Les Claypool) is one of his best customers. Well I feel very flattered, thank you very much for the compliment I looked at some of Carl Thompson's work and his craftmanship is outstanding. It looks like he does a lot of carving which is way beyond my abilities. To shape the body outline on mine I made a template out of 1/4" mdf, honed and sanded it into the shape I wanted, then traced the outline onto the body, rough cut on the bandsaw, then I attached the template and used a table-mounted router with a copy bit installed that has a ballbearing that follows the template. I'm not that good at hand shaping, so I used jigs and templates wherever I could. Oh, I forgot to say when mentioning about Stewmac, they have pretty much every guitar making tool you could ever want. At first glance it might seem you need to spend a whole bundle on tooling to make a guitar, but look again. Many of those tools can be quite easily made, especially for those of us who have a lathe and mill. The only thing I would say that might be a bit hard to make would be the nut slotting files, these have to be a pretty precise fit for the strings.